This image from the European Space Agency's Planck satellite shows the space observatory's view of the same region observed by the Antarctica-based BICEP2 project. The Planck data suggests that light patterns that confirmed cosmic inflation theory were actually caused by space dust. It is the announcement no one wanted to hear: The most exciting astronomical discovery of 2014 has vanished. Two groups of scientists announced today (Jan. 30) that a tantalizing signal — which some scientists claimed was "smoking gun" evidence of dramatic cosmic expansion just after the birth of the universe — was actually caused by something much more mundane: interstellar dust. In the cosmic inflation announcement, which was unveiled in March 2014, scientists with the BICEP2 experiment, claimed to have found patterns in light left over from the Big Bang that indicated that space had rapidly inflated at the beginning of the universe, about 13.8 billion years ago. The discovery also supposedly confirmed the existence of gravitational waves, theoretical ripples in space-time. "Unfortunately, we have not been able to confirm that the signal is an imprint of cosmic inflation," Jean-Loup Puget, principal investigator of the HFI instrument on Planck at the Institut d'Astrophysique Spatiale in Orsay, France, said in the statement. The conclusion is the result of a collaborative analysis by scientists with both BICEP2 and Planck, using data from both telescopes as well as the Keck array at the South Pole. All-sky maps of the cosmic microwave background (CMB) from the Planck satellite give a better idea of how interstellar dust conflicts with the CMB. The results suggest that a signal seen by the BICEP2 collaboration, purported to be evidence of inflation in the early universe, was largely contaminated by dust. If inflation did occur when the universe was born, it would have perturbed the fabric of the universe — which scientists call space-time — creating what are known as gravitational waves, according to the new statement. These waves would have then created swirls in the polarization of the CMB, or what are called B-modes. Thus, the discovery of these B-modes would have meant both confirmation of inflation and evidence of gravitational waves. "Searching for this unique record of the very early universe is as difficult as it is exciting, since this subtle signal is hidden in the polarization of the CMB, which itself only represents only a feeble few percent of the total light," Jan Tauber, ESA's project scientist for Planck, said in the statement. When the BICEP2 team announced in March that it had detected B-modes, the claim met almost immediately with concerns about the influence of dust. Interstellar dust gives off polarized light at similar frequencies to the CMB. According to the ESA statement, the BICEP2 team chose a region of the sky where the researchers believed dust emissions would be low. 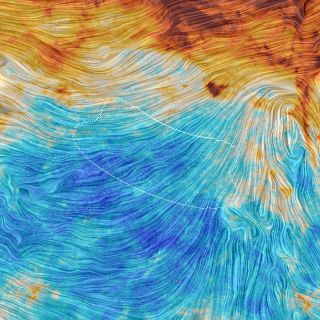 This all-sky map from the European Space Agency's Planck satellite shows the cosmic microwave background, the oldest light in the universe. But the Planck results show that the light from dust is significant over the entire sky — including the region where BICEP2 purportedly observed B-modes. While BICEP2 only sees the sky in one wavelength of light, Planck observes the universe in nine wavelength channels, which help this instrument separate the CMB signal from the background. When the dust is accounted for, the signal identified by BICEP2 becomes too faint to be considered significant. "The amount of gravitational waves can probably be no more than about half the level claimed in our earlier study," said Clem Pryke, a principal investigator of BICEP2 at University of Minnesota. The researchers say the joint collaboration does put an upper limit on how many gravitational waves could have been created by inflation, and shows that finding B-modes will require more-sensitive measurements. The scientists emphasized that the results do not eliminate the theory of inflation. BICEP2, Planck, Keck and other CMB telescopes, including POLARBEAR, will continue to search for B-mode polarization signals. "The gravitational wave signal could still be there, and the search is definitely on," said Brendan Crill, a leading member of both the Planck and BICEP2 teams from NASA's Jet Propulsion Laboratory in Pasadena, California.